Performance and risk are the principal concerns of investors. In the case of bonds, market expectations are expressed in terms of interest rate moves, rather than price changes of individual securities. Institutional investors are required to quantify how specified interest rate moves would affect the market value of their portfolios. What if rates increase 100 bps? What if the curve flattens or steepens? By ‘interest rates’ we mean a benchmark yield curve, such as the Treasury curve or the LIBOR swap curve. To understand the impact of such changes on portfolio value, they need to be converted into price movements of individual securities. In this fourth installment of my blog series on option-adjusted spread (OAS) analysis, I compare and contrast OAS-based and yield-based stress testing. Many bond professionals use yield-based analysis to assess market risk. They rely on the yield-to-worst (YTW) concept, sometimes in conjunction with additional analytical tools, such as VaR and modified duration. To simplify the discussion below, I assume that the call price is always par. In this case YTW is the lower of yield-to-call (YTC) and yield-to-maturity (YTM); if the price is above par, the YTW is the YTC; below par it is the YTM. Depending on the price, the colloquial terminology is that the bond is ‘trading to the call’ or ‘trading to maturity’. The transition from trading to call to trading to maturity is abrupt, to put it mildly. 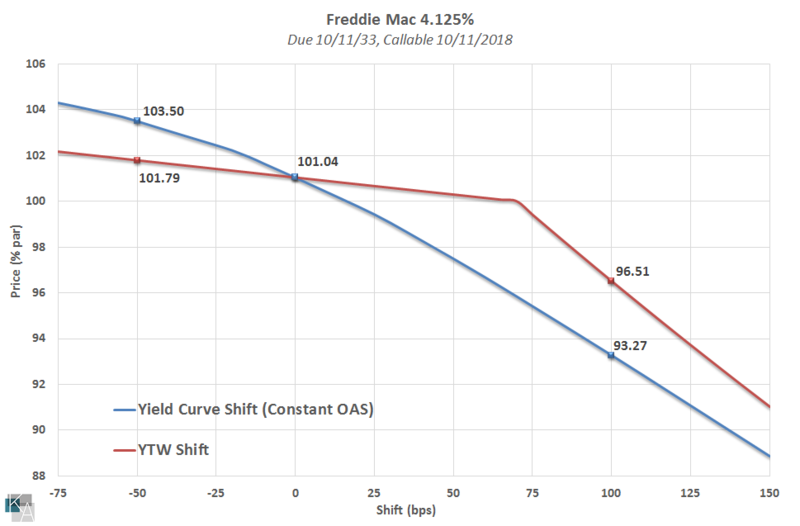 The red line in Figure 1 shows the YTW-based shifted prices for a 4.125% bond due 10/11/2033, callable at par in 2018, and currently trading at 101.04 — the YTC is 3.425, the YTM is 4.038, and therefore the YTW is 3.425. Shifting this YTW 50 bps down results in a price of 101.79 (shifted YTW is YTC), and shifting it 100 bps up results in 96.51 (shifted YTW is YTM). Continuing with the Figure 1 example of the callable 4.125%, at a 20% interest rate volatility, the OAS corresponding to a 101.04 dollar price is 22 bps. The smooth blue line shows the OAS-based yield curve shifted prices. A 100 bps increase in interest rates causes the price to fall to 93.27, and a 50 bps decline in rates causes the price to rise to 103.50. Comparing the two curves, we observe that if rates decline the OAS-based price is higher than that based on YTW, while if rates increase the relationship is the opposite. Why does this happen? The reason is that depending on the price, YTW essentially values the bond to one of two ‘maturities’, either to the call date or to the stated maturity. Whether its price is 100.25 or 106, in the YTW world a bond trading over par is implicitly assumed to be called. YTW ignores the possibility that a bond ‘trading to the call’ may not be called, or that one ‘trading to maturity’ may be called. However, the market price incorporates such possibilities, and OAS-based analysis implicitly accounts for them. Returning to the Figure 1 example, there is no assurance that the bond will actually be called in 2018, because the call decision depends on the long-term rate. The price is depressed by the possibility that the bond will not be called. This is obvious by observing that the price of a 4.125% bullet maturing in 2018 would be considerably higher than 101.04, and the corresponding YTM would be much lower than 3.425%. The deficiency of yield-based risk analysis of bonds with embedded options is that yields and interest rates do not move in lockstep. Yield-based analysis, restricted as it is to one of two maturity points, is blind to the rest of the curve, including its shape. For optionless bonds, the YTM moves more or less in parallel with the yield curve, but with options all bets are off. And let’s keep in mind that virtually all agency bonds and longer-term munis are callable. You may wonder about the choice of the 20% interest rate volatility. We used it to determine the OAS, and the prices resulting from yield curve shifts. To appreciate the sensitivity of the volatility choice, notice that with the +100 bps shift, the price decreased by 7.77 points. At a 15% vol the price would decline by 8.36 points (-0.59 points), and at a 25% vol it would decline by 7.38 points (+0.39 points). Such discrepancies are surely acceptable for risk analysis, which is an inexact discipline to begin with. As we see, the results are relatively insensitive to the choice of volatility – OAS-based stress testing is robust. In my next blog, I’ll tackle the subtleties of after-tax valuation and address particular confusion between yield-based and yield-curve-based risk analysis in the case of tax-exempt municipal bonds.